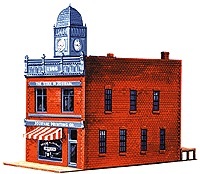 These easy-to-build kit features colored plastic parts, preprinted signs and complete instructions. Click picture to see large view This decorated bridge is fully assembled and painted. Features wood detail, and comes with 5" nickel-silver track and handpainted figures. Bridges can be ganged together. Click picture to see large view These decorated bridges are fully assembled and painted. Feature wood detail, and come with 5" nickel-silver track and handpainted figures. Bridges can be ganged together.